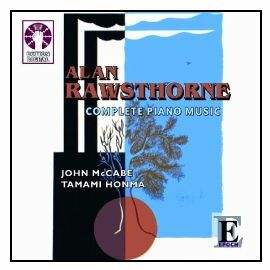 John McCabe's CD for Dutton Epoch of the complete solo piano music of Alan Rawsthorne (together with piano duets by Rawsthorne and Lambert, in which he is joined by pianist Tamami Honma) has been very well received on its release. The Gramophone magazine review calls it 'definitive' and adds 'Excellent performances, well-recorded', awarding it a Gold Star rating. BBC Music Magazine awards it four stars in its own ratings, and says, 'John McCabe plays with great authority and fluency'. The CD contains, amongst other, better-known works such as the Bagatelles and Sonatina, two early works which only surfaced after the death of the leading pianist and teacher, Gordon Green, who gave the premieres of the works. McCabe was taught by Gordon Green, and met Rawsthorne, a great friend, at Green's house in Liverpool. For full details of the CD's contents and record number, see Piano Discography - solo recordings and Piano Discography - with other artists. John McCabe is the author of the definitive biography of Alan Rawsthorne, published by OUP.